He would choose Brahms and all the Variations if he had to choose only one record. His book would have to be Homer to translate. The luxury item would be a huge, supersized pot of seedy mustard as any meat tastes good with mustard. Sue Lawley – “you are prone to getting into scrapes – affair with one of your colleagues…” Questions about ambitions followed. Boris was full of bonhomie and explained that he was always interested in being an MP. It is the single most interesting job you could do – it is such a broad canvas. He would also like to keep up journalism. If he had to choose he would choose being an MP. As far as politics goes he is interested in agriculture, trade – where he has had personal experience. Apparently Boris’s ex mother-in-law claims that he always wanted to be PM. Boris replied that MPs are like crazed wasps in a jam jar. Of course everyone would like to lead the party he explained. All politicians in the end are like crazed wasps in a jamjar, each individually convinced that they are going to make it. My ambition silicon chip has been programmed to try to scramble up this ladder, so I do feel a kind of sense that I have got to. Sue listed his academic achievements and Boris admitted he was a colossal swot – he strongly recommended boning up. “I’ve got a lot of energy and need to use it all up”. Time is ticking away and he feels programmed with a sense of duty and to climb up and achieve more – “we need all these grasping hacks to compete”. After The Times Max Hastings rescued him and he owes a huge amount to him. He was Brussels correspondent (Daily Telegraph) for five years including the time when the Berlin Wall fell. He finds being Editor of The Spectator (since 1999) a wonderful job. From this point on Sue presses very hard about “misdemeanours“. 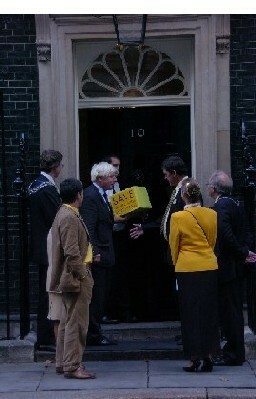 Boris said: “this isn’t talking about Haydn – this is being a hidin’ to nothing”. The image conjured up through this tenacious probing about his shortcomings was of a Boris pushed into a tight corner held up at knifepoint. After a few uncomfortable spluttering moments there was a response of: ” … okay, there have been misdemeanours – you keep referring to misdemeanours … but there are far fewer demeanours than there have been misdemeanours”. His book is about four suicide bombers from the North and the heroine is called Cameron, so it is quite uncanny. It is a comic thriller. Roger Barlow rides a bike and is exercised by whether the papers will discover his extramarital affair – playing with fire – does that have any resonance with real life, asked Sue. Did he like playing with fire. Boris replied that if this was her theory about him then there might be an element of truth in this – but he wouldn’t take unnecessary risks. He was asked whether he used comedy to override his ‘misdemeanours’ – or did he use charm to get by, taking into account his reported misdemeanours or mishaps. Boris explained that when he was young he should have used grommets because he couldn’t hear and he therefore developed an evasiveness. So, finally alone, how would he feel on this deserted island? Boris would have a disciplined plan to rebuild civilisation. He likes making things with wood and recently made a treehouse for his children. He would sing a few hymns, march up and down and he would write. His aim would be to get to the heart of things – “It may sound pretentious” he said. He is writing a thesis on the meaning of nationhood at the moment and getting up very early every morning and it was knocking his brains about a bit. He was also working on a book about how the Romans ran Europe. Of course on an island there would be no data so he would download all he had and then start plagiarising it (Sue erupts into giggles). Will she spare our Boris? I wouldn’t bet my shirt! I know this is regarded by my chums as being bizarre to the point of fetishism, but I have a soft spot for Cherie Blair. No, when I say a soft spot, I don’t mean a bog in the west of Ireland. I mean I kind of like the look of her. I even like her new Rod Stewart hairdo, and her lipsticked Liverpudlian sassiness. Unlike so many of my Tory pals, I have no desire to see her locked up. Boris Johnson MP has today called on the Government to ensure the future of Townlands hospital. I believe Henley needs a hospital, but this is not just a question of clinical need, it is also a question of democracy. If Labour persists in its massacre of community hospitals then it should have the guts to explain the logic of this frankly bizarre decision to the British public rather than hiding behind the excuses of unaccountable, unelected officials. the valuable worked carried out by community and cottage hospitals in providing intermediate and step-down care. 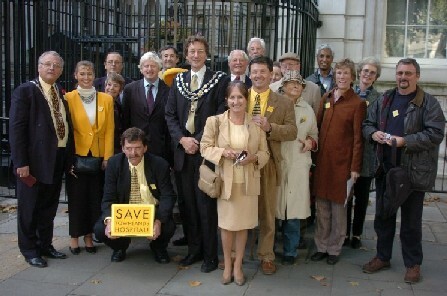 many community hospitals in Oxfordshire, such as Townlands hospital in Henley-on-Thames, are threatened with closure; and calls upon the Government to ensure that these proposed closures are forestalled and that community hospitals are placed back at the heart of community care. That this house recognises the valuable work carried out by community and cottage hospitals in providing intermediate and step-down care; notes that the cost of treating a patient in a local community hospital is often significantly lower than the cost of treating one in a district general hospital; further notes that “delayed discharge” as a result of lack of capacity at the intermediate care level continues to plague the NHS leading to a shortage of acute beds; further notes too that many community hospitals in Oxfordshire, such as Townlands hospital in Henley-on-Thames, are threatened with closure; and calls upon the Government to ensure that these proposed closures are forestalled and that community hospitals are placed back at the heart of community care. That is why it was so wonderful to read the truth on the front of yesterday’s Daily Telegraph, that the world is getting safer and safer, and that there are 40 per cent fewer conflicts than in the 1990s, and that terrorism is certainly not the greatest threat to humanity. The MMR is safe – what other scare stories are nonsense? “It is perfectly obvious that the Government intends these ID Cards to one day be made compulsory. I want to make it clear that I will in no circumstances carry one and even were I compelled to do so, I would take it out and destroy it on the spot were I ever asked to produce it. It is a plastic poll tax that will do nothing to assist the struggle against terrorists and will hugely expand the powers of the state over the individual”. The Bill, which passed by a majority of just 25 votes, will now go to the Lords where it is expected to face further stiff opposition. The true scandal – is that ministers appoint these people [quangocrats], give them considerable powers, and yet it seems that ministers are completely unaccountable for what they do once they have been appointed. No one seems to be in charge. No one is accountable. It is infamous. Instead of wasting everybody’s time and money with politically correct gerrymandering of public sector appointments, Patricia Hewitt should recognise that she is presiding over a massacre of local hospitals, and that it is her job – to justify the actions of her appointees. My temperament is so generally peaceable that some mornings I wake up and think I have no enemies in the world. I rub my eyes, and stretch, and wonder what it is I am fighting for, and who it is I am fighting against. And then I open the paper, and I behold the visage of Patricia Hewitt, and it all comes flooding back. I see the Health Secretary, and I see her spectacles glittering with the sheen of politically correct triumphalism. I hear her on the radio, with her bossy Aussie twang. I listen to her set out her latest jargon-laden agenda for interfering in the lives and habits of British families, and after a few paragraphs of Hewitt I am afraid I am fit to be tied. I am very sorry to have been so dilatory in my blogging, but as you all know by now, i am just a potemkin figurehead in this blog – the real star is of course Melissa. I want to make three points today. The first is that David Cameron offers the Tories a real chance of winning the next election, reconquering huge sections of the electrorate that think we’re a bunch of space cadets, and so on and so forth blah blah fishcakes (see last article). The next is that we must launch a national crusade to save cottage hospitals. Across Britain there is an undeclared war to close valued local hospitals, such as the one in Henley. These institutions were created and funded by local people, usually out of public subscription. They were then of course nationalised by the NHS in 1948. Now people are finding that their hospital is about to be shut, and there seems to be not a damn thing they can do about it. I object to what is being done not just for clinical reasons, though these are powerful in themselves – it is very useful to have step-down hospitals, relieving pressure on the acute sector, and of course providing a local service for people who need immediate treatment. It seems insane to shut the smaller local hospitals, when so many beds are blocked in the acute sector with patients who shouldn’t really be there, and when we are still afflicted by waiting lists unknown to any other western society. There is a further point. It is an outrageous hollowing out of local democracy that a hospital built by local people, funded by local people, loved and treasured by local people, can be shut on the say-so of a healthcare hierarch who is ACCOUNTABLE TO NO ONE. It is time for people across the country to seize the initiative and stop this national campaign of demolition, and any interested parties can begin by coming with an Oxfordshire delegation to Downing Street on October 20, when we will present a petition to Tony Blair. Last point: paternity leave. I can think of nothing more calculated to drive young fathers up the wall than to be required or otherwise pressured into taking six months off on the birth of a child. I can think of few things more maddening for small firms already struggling with regulation of one kind or another, than to be required first to fill in for these absent fathers, and PAY them during their absence, and then to make way for them again on their return. And frankly, folks, is it really in the interests of the babies that they should be incarcerated with their fathers, otherwise loving and doting men who will, I am afraid, be driven mad with cabin fever in an intensifying hell of milupa and perfumed nappy sacks? Over the past few months I have lost count of the number of people who have asked me – satirically – why I am not standing in the current Tory leadership contest; and after I have bumbled out some reply, they have always said, oh well, who are you backing? “David Cameron,” I have said, quick as a flash, and for the most part this answer has so far drawn a look of anxious blankness, the look you see when people are sure that they ought to have read some classic work, and are in two minds whether to bluff it out or admit ignorance. “Oh yes,” they say, mentally noting that they ought to get to grips with the subject of David Cameron, along with Stephen Hawking’s Brief History of Time and Midnight’s Children by Salman Rushdie. I can’t believe it. They really are going to do it. The Labour Party seems to think it can just plonk Gordon Brown on the English public and that we are all going to swallow it. It’s an outrage. Not only is Gordon Brown a chippy, high-taxing, gloomadon-popping nannying old socialist, he is also a Scot. He sits for a Scottish seat, called Motherclyde or something, and he is presuming to tell us, the English, how to order our affairs, and to accept his diktat on controversial questions concerning healthcare and admission to our schools and universities (on which matter Gordon demonstrated not only his hysterical resentment of Oxbridge but also his lust to intervene). We English MPs have no corresponding say on those questions in so far as they affect people in Scotland and – here is the crowning absurdity – neither does he, Gordon, sitting for Motherclyde, on the health and education of his own constituents. It is a constitutional abomination, aggravated by the injustice that 8.1 million English voters went for the Tories, when 8.04 million English voters went for Labour, and we still have a socking Labour majority in England alone. In the circumstances, does Labour sincerely think it can win the next election, without reform and with a Scottish MP leader? I say bring it on.